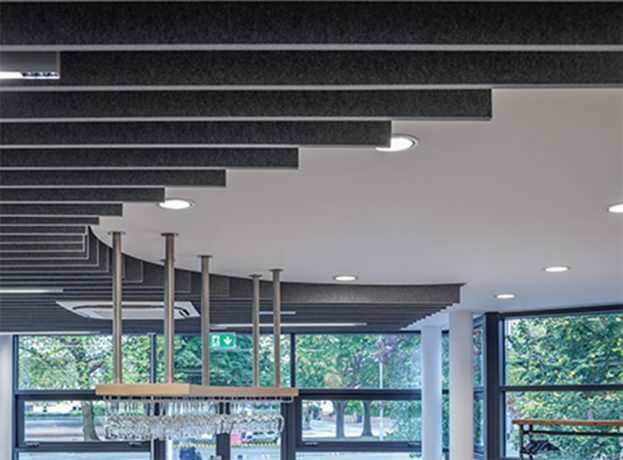 Remarkable and revolutionary; Quietspace® FrontierTM is a complete modular acoustic ceiling system for targeted sound absorption. An ideal application for open-plan settings, Quietspace Frontier creates a unique feature that enhances spaces visually and acoustically. Adjustable prior to and post installation; Quietspace Frontier can be suspended or direct fixed with its patented aluminium channels and connector clips, allowing for complete creative and acoustic flexibility. Made from Autex CubeTM in 15 vibrant colours, Quietspace Frontier is available in four modular designs that can be mixed and matched to create unique forms and patterns. Also available in the Quietspace Frontier range is Axis; a bold lattice design inspired by Sarah Langford’s Unispace office in Auckland, New Zealand. For a personal approach, the Autex design team can create bespoke fins to add life in any environment. Cube is made from 100% recyclable polyester and is completely safe, non-toxic, non-allergenic and non-irritant.